Savory (Satureja spp. ): growing, planting, caring. A cousin of the Sage. Scientific name : Satureja spp. Satureja is a genus of aromatic plants in the mint family Lamiaceae, native to North Africa, southern Europe and the Middle East. 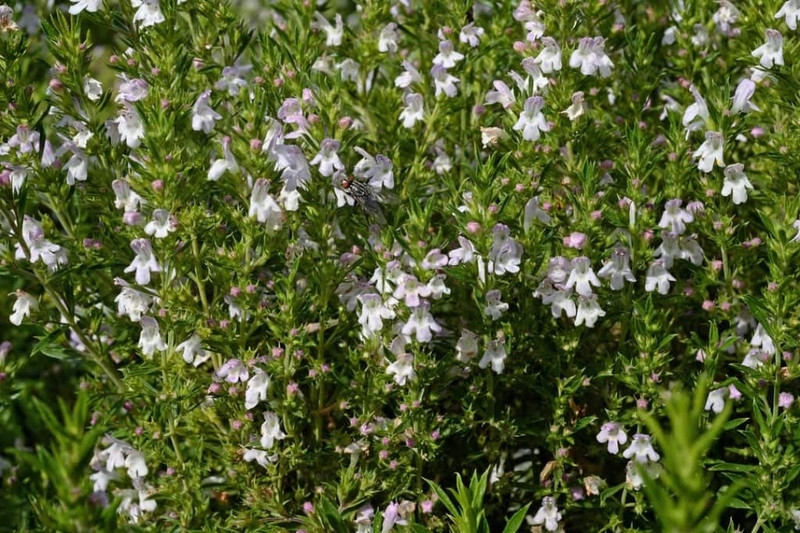 Satureja species are annual or perennial low-growing herbs and subshrubs, reaching heights of 15–50 cm (5.9–19.7 in), with small leaves and white to pale pink-violet flowers forming in whorls on the stem. The savory bears opposite, simple, narrow, fragrant leaves on hairy stems. The flowers are borne by upright stems. The plant measures between 5 and 40 cm depending on the species. Sow savory under shelter or indoors, starting in March. Fill a seed tray with a mixture of potting soil and river sand, then tamp the surface flat with your hands. Cover each seed delicately with a few millimeters of soil mix. Finish by water with a fine mist to completely wet the soil. You can also sow outside in the spring - preferably in a sunny spot. After 3 weeks, thin by keeping only one plant every 20 cm. After sowing in a box, transplant into buckets filled with soil and sand, when the plants are 3 cm high. At the end of the frosts, in May, you can plant your savory in the garden in drained, light, limestone, poor, in full sun. Tamp well around the roots. Mulch the base of savory, it will save you the hassle of watering too much and weeding in summer. A mineral mulch is suitable, or an organic mulch in a thin layer. You can harvest leaves all year long.